PLEASE NOTE: We offer several more environmentally friendly alternatives to "Foamed PVC" as PVC will give off very toxic "dioxins" when incinerated as waste for disposal. This product is one of them but to view a table comparing all the alternatives & showing available sizes please - click here. Honeycomb core board with White paper surface both sides. The brown tint is solely due to flash photograpy. The actual surface is very white. Honeycomb Core Board is a 100% paper-based graphic board has been positively received due to its performance and environmentally responsible profile. Honeycomb Core Board is made from renewable resources (a minimum of 20% recycled fibre content) and is recyclable to provide the perfect blend of printing performance and environmental stewardship. Honeycomb Core Board's proprietary, patent-pending process features an engineered paper core and water-based adhesives coupled with a white printing surface. Produced chlorofluorocarbon-free, it emits zero volatile organic compounds (VOCs) during manufacturing. Honeycomb Core Board is suitable for a variety of wide formats and digital processes where foam boards have traditionally been used. Honeycomb Core Board's unique structure can handle the most demanding of graphic display applications due to its superior rigidity and dimensional stability. This enables printing directly onto the structure compared to most other display board configurations where you have to print first and then mount onto a rigid substrate. The lightweight display board accommodates most inks and adhesives and is heat-resistant up to 300 degrees Fahrenheit. Honeycomb Core Board Build is recommended for short-term to semi-permanent interior POP applications as a replacement for traditional wood or foam materials. The product works with most commercial connective systems such as edge tape, plastic or metal edging, and channels. 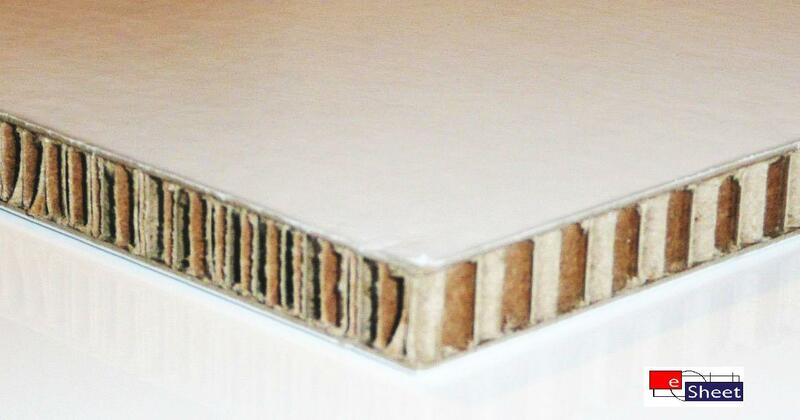 It offers superior strength over traditional corrugated and foam board substrates. • Interiors – caravans, static homes. • Set building in film industry. • Printers can inkjet print scratch-resistant patterns, wood-grains and metallic finishes or photos directly onto the board. • Use adhesive to mount paper posters or scrap-book paper to X-Board to make a pinboard. • Wrap it with painted or inkjet printed art canvas material. • Wrap it with decorative pre-pigmented fabrics for soft furnishings on walls. • Cold-press rigid high-pressure laminates to it for vertically mounted display applications. • Paint it with quick-drying blackboard or fluorescent paint. • Paint it with hobby paints for use in theatre stages or film sets. • Paint it for shop window displays. Slightly lower price than PVC Foam. Excellent printability with UV screen or inkjet printing equipment at a similar price to PVC Foam boards. Produced mostly from post-consumer recycled paper waste. No wax or polyethylene used in the manufacturing process, allowing the board to be easily repulped back into paper by recycling agents post-use. Honeycomb Board - Core board with White paper surface both sides. Fire Behaviour B3 as per DIN 4102. No explosive and no toxic fumes when burned. Low fire load rating based on low calorific value when burning. Increased Fire Rating material can be produced on request if large quantities. Low Temperature Resistance Exposure to -5 oC for 48 hours. High Temperature Resistance Exposure to 100 oC .